I visited the Orlane Lounge during Mercedes-Benz New York Fashion Week this year and had the pleasure of meeting the Orlane Paris team and testing out a few exciting new products. 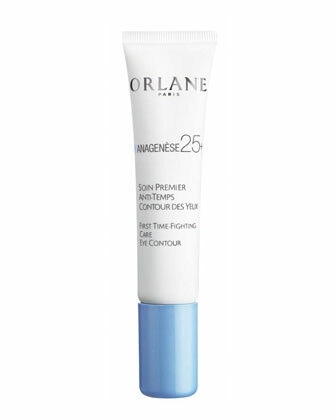 Orlane has a line dedicated to a group that cares about wrinkle prevention and anti-aging products but doesn't necessarily need the full wrinkle blasting weaponry that certain other skin types want. Anti-aging and wrinkle-fighting products tend to be associated with older, more mature skin, but us 20-somethings still want products to keep us looking youthful! 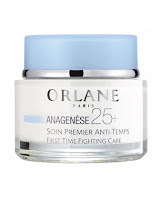 Enter Orlane Paris's Anagenese 25+ Complex skincare program. 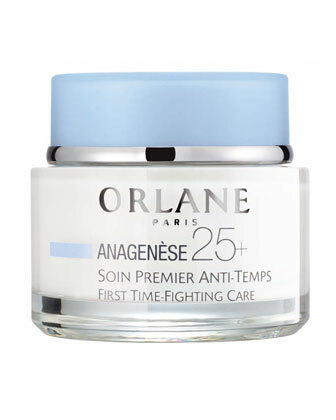 Orlane says aging begins to settle in at age 25 and comes visible towards ages 35-40…Um scary! 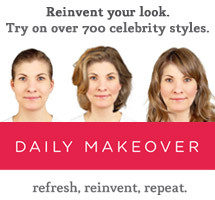 By fighting against visible signs of again now, you can delay the look of mature skin from becoming apparent. Inneresting. Here's what scares me: at 25 the skin begins to tire out, recovers less quickly and becomes occasionally lined. Ahh! I've been trying out three products in their program and am definitely impressed. The first is a Morning Recovery Concentrate First Time-Fighting Serum, the second is a First Time-Fighting Care Eye Contour and the third is a First Time-Fighting Care Cream. The formulas are rich in hibiscus seed extract, bio-marine complex, hyaluronic acid, rich in collagen and includes hints of mineral salts, ginseng and Vitamins A and E.
First Time-Fighting Care –a cream rich that activates the production of collagen and synthesis of hyaluronic acid (which hydrates and protects the skin), encourages cell renewal and stimulates microcirculation. It helps soften your fine lines and evens the tone in your complexion. Your skin feels smooth, radiant and fresh. First Time-Fighting Care Eye Contour- a gel-cream with lily extract , hibiscus seed extract and organic silicon. It reduces dark circles and refreshes the eyes. 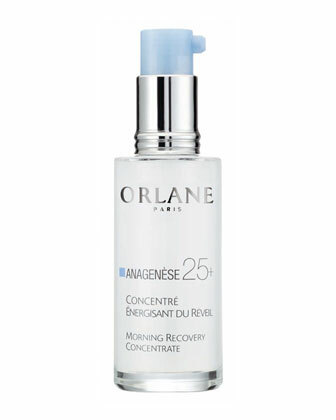 Morning Recovery Concentrate First Time-Fighting Serum-a silky white, gel serum with ginseng extract. This serum tones, revitalizes and activates surface microcirculation. The serum also activates production of collagen-which will plump up your skin and prevent sagging. Do know that you're gonna drop a little loot on these fast absorbing solutions, but consider how cost effective it'll actually be considering you only need a few drops of each formula to last you the whole day. If you're between the ages of 25-35 are you worried about wrinkles and fine lines? Let me know! Enjoy my fellow cohorts! 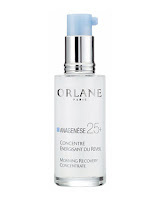 Follow Orlane Paris on Twitter: @Orlane_Paris and follow The Beauty Buff on Twitter: @beautybuffblog!